Register by Oct. 5 to take advantage of advanced registration discounts. ObesityWeek registration takes less than 15 minutes. Enter code TOSOWN to receive a special discount on registration. Register now! Rooms Available: Book Your Room to Receive Our Group Rate! Register, then book your room for ObesityWeek. Due to the unprecedented attendance for ObesityWeek 2018 and two large events in Nashville, hotel rooms are selling fast. ObesityWeek has secured additional hotels around the city, in close proximity to Music City Center, the site for this year’s meeting. In order to receive the group rate, you MUST register and use the link provided in your registration confirmation email. Rooms are on a first-come, first-served basis. Click here for hotel listings. Congratulations to these TOS members for their groundbreaking research! Don't forget to add journal symposium to your itinerary as you plan your ObesityWeek schedule. Make your book, tape, CD, DVD or other publication available for purchase during ObesityWeek at the ASMBS Marketplace and Bookstore. If you are interested, please complete the Bookstore Agreement Form and email to shelby@asmbs.org or fax to 352-331-4975 by October 19, 2018. For more information, visit http://bit.ly/2Ni69rS. The American Society for Metabolic and Bariatric Surgery (ASMBS) is proud to once again represent all of our members as a Founding Champion of National Obesity Care Week (NOCW). Joining the ASMBS as Founding Champions are the Obesity Action Coalition (OAC), The Obesity Society (TOS) and the STOP Obesity Alliance. Join us in recognizing National Obesity Care Week (NOCW), October 7–13, 2018. We invite you and your fellow healthcare colleagues to join us in this fight and help change the way WE care about the disease of obesity and those affected by it. As a bariatric professional, there are a variety of ways that you and your hospital can help support the NOCW 2018. Learn more about how you can get involved today. Click here to learn additional information about National Obesity Care Week and ways to take ACTION. 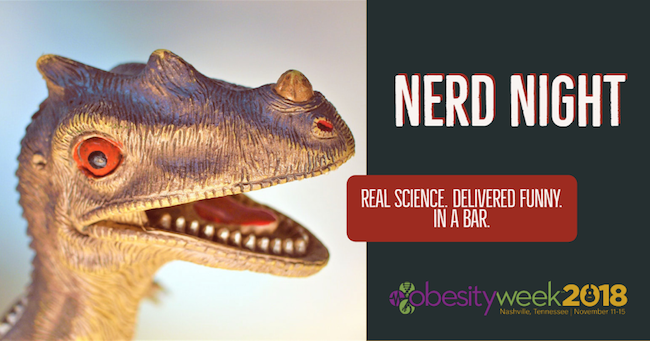 Can't Attend ObesityWeek 2018? Enjoy it on the Go! Pre-order today and experience the unique, international event in the comfort of your own home. With ObesityWeek OnDemand, you can access abstract presentations, partner symposia, educational courses and video sessions at your fingertips. With OnDemand, you can earn up to approximately 120 CME credit hours. Order today! 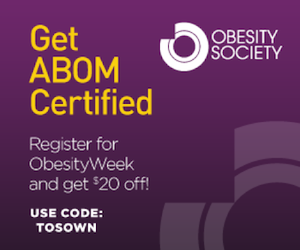 Join the American Society for Metabolic and Bariatric Surgery (ASMBS) to receive members-only discounts to ObesityWeek registration. ASMBS is an educational society comprised of nearly 4,000 medical professionals actively involved in weight loss surgery. Members are primarily surgeons, physicians and integrated health professionals such as behavioral health specialists, nurses, nutritionists, advanced practice providers, dieticians and clinic managers. If you are a non-member and want to receive the ASMBS-member rate, please submit your completed application no later than Friday, Oct. 12, 2018. Click here for more information about membership.